The Huawei P20 is the latest flagship handset for the smartphone giant. It's a beautiful handset with some of the smartest tech we've seen from the brand. Select your desired options to find the best Huawei P20 deals for you. It’s no secret that Huawei is one the world’s largest mobile communications manufacturers, and in recent years they’ve quietly been building a reputation for releasing fantastic smartphones that rival some of the most high-end handsets on the market. So when we found out that the brand was releasing a new flagship this year, with the P20 range, its safe to say that we were more than a little excited. 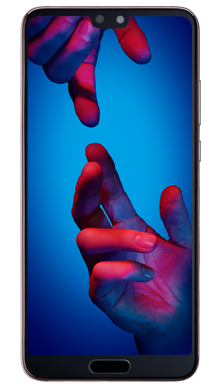 The Huawei P20 takes centre stage as the mid-range handset of the three new ones, and it only further cements Huawei’s solid reputation in the smartphone industry. Not only does it look absolutely stunning, but it features some incredibly impressive technology that won’t fail to impress users. 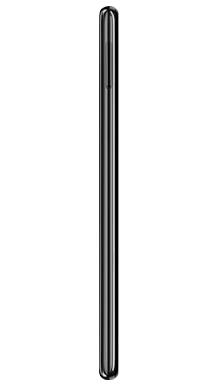 The Huawei P20 has a premium design that can only be described as elegant in its sophistication. The hardened glass back gives a smooth and glossy finish, and the lack of bezels maintain the classic minimalism that we’re used to seeing from Huawei. Interestingly, the notch on the front of the P20 make it uncannily like the iPhone X, we’re not sure if that’s what the brand was going for, but there’s no denying the resemblance. The P20 is available in three different colours: Black, Midnight Blue and Pink Gold. Whichever colour you choose, the P20 is bound to turn heads as it stands out against the majority of other high-end smartphone releases. While the hardened glass back adds to durability, it is extremely smooth to the point of being slippery, so it may be liable for accidental drops. With that in mind, we’d make getting a protective case for your P20 a priority. You needn’t worry about a screen protector, however, as the P20 comes with one included, which is fantastic thinking on Huawei’s part and makes us wonder why more smartphone manufacturers don’t do this. 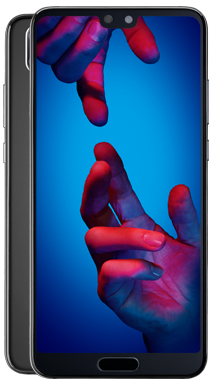 The display on the Huawei P20 is an FHD+ panel which comes in at 5.8 inches and features an 18:7:9 aspect ratio and a 1080 x 2244 resolution; in short, it absolutely fantastic. You can customise the display to your liking in settings and the phone will conveniently adjust its brightness based on your surroundings. Colours are vivid, contrast is handled perfectly, and shadows and highlights appear in all the right places. It’s a stunning display that we simply cannot find fault with, and its size means the that the P20 sits comfortably in between a smaller smartphone and a phablet, and is still perfectly comfortable to use. The Huawei P20 only features one speaker, but the sound quality is still decent and should satisfy any user, whether you’re a music expert or simply looking for a good enough audio experience to see you through your daily commute. Interestingly Huawei has followed many other high-end manufacturers and have chosen to omit the headphone jack from the design of the P20. While this may seem like an inconvenience, we have to admit that its a feature that we’re getting more and more used to these days. It does mean that users will have to get their hands on a pair of wireless Bluetooth headphones if they want to listen to their music without using the charging port of their phone, but these are reasonably affordable nowadays, so you don’t have to pay the earth for a decent set. We actually find it more convenient too, there are no annoying wires to get in the way, and it's a great convenience for when you’re working out or on the move. Huawei is known for their impressive camera setups and the Huawei P20 is no exception. 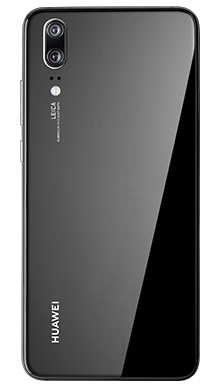 It features dual Leica sensors on the rear; a 20MP sensor that works in tandem with a secondary 12MP one to deliver absolutely fantastic shots every time. There’s the added bonus of AI image stabilisation and 2 x hybrid zoom to make sure that your photos look as good as possible, and a range of different modes to choose from so that all the internal, advanced camera technology is at the perfect setting to deliver the perfect photograph to suit your environment. The camera app is extremely quick but perhaps isn’t the most simple, due to the high-tech Leica optics technology in there. This doesn’t bother us though, as the performance more than makes up for it. The camera performs incredibly well in low light as well, delivering shots that we feel are only bettered by the P20 Pro. Round the front is a mighty 24MP lens, so your selfies will undoubtedly be just as impressive as your normal photographs. You can add portrait mode for a little extra drama in your selfies, or beauty mode if you’re feeling you need a little extra help on an early start. When it comes to video recording the P20 is equally as good, with 4K capabilities that deliver exceptionally good videos to allow you to capture your most important memories in stunning quality. The P20 runs on the Huawei built Kirin 920 chipset which delivers a fantastically quick smartphone experience, particularly if gaming and media is your thing; its responsive, smooth, and won’t let you down in the middle of your favourite game or movie. It comes with EMUI 8.1 which is essentially the same as Android Oreo 8.1, and the interface is extremely smooth and easy to use. There’s 4GB of RAM on board and a whopping 128GB of internal storage, which, we’re sure you’ll agree, is plenty enough room for the average user to store there favourite apps, photos and files. The large 3400mAh last all day and easily into the night, but you can alter the settings to make it more power efficient, and the phone will let you know about particular apps which have a tendency to drain your power quickly. While there’s no wireless charging, the Huawei P20 is compatible with fast charging and even comes with its own USB-C fast charging cable to enable you to power up quickly when you do need a boost. Overall the Huawei P20 is an extremely impressive smartphone that won’t let you down, whether you choose it for personal or professional use. Sitting in the middle of the P20 Lite and the P20 Pro, it has all the innovative technology and premium design that you’d expect from Huawei, but it won’t break the bank. The elegant and expensive looking design is simply stunning and is sure to turn heads, while the display has to be one of the best that we’ve seen of this year's releases. The camera thoroughly impressed us all here at the MEtrofone head office; it delivers fantastic photographs with every shot, even when you’re taking selfies. The Huawei built chipset gives users an extremely fast and responsive smartphone experience, with no delay and a battery that will easily see you into the later hours. Here at Metrofone, we’re making it our mission to always bring our customers the very latest smartphone deals. Our team work tirelessly to always ensure that they are securing the best prices to bring you massive savings. We’re proud to bring you some of the very best Huawei P20 offers out there, whether you’re looking for bags of data, endless calls and texts or a great added extra; Metrofone is sure to have a deal to suit your needs. We work exclusively with EE, the UK’s leading mobile phone network so that we can be sure that our customers always get the very best service and connection regardless of where they are. When you sign on to an EE pay monthly contract you could get 3 months free BT Sport and free roaming, so you can use your mobile phone data wherever you are. Plus, with our great free delivery service, you could have your brand new Huawei P20 the very next day! We’ll also offer you a fantastic cashback offer on your smartphone deal wherever we can so that you’re saving, even more, each month. 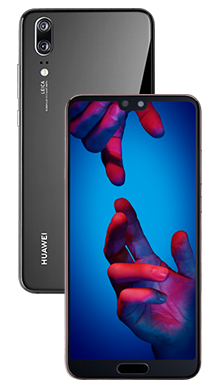 If you’re thinking of going for the Huawei P20 as your next smartphone, but you’d some more information about the phone, or if you’ve seen a great Huawei P20 deal but want to know more, then why not call our dedicated customer service team on 0333 900 1144 today? They’re based in the UK and are on hand to give you all the help that you need in choosing a new smartphone and tariff.